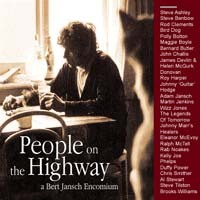 "People On The Highway - A Bert Jansch Encomium" (Market Square MSMCD106) UK distribution through Koch International) delivers newly-recorded and highly individual treatments from the man's extensive catalogue by his peers and subsequent generations of artists influenced by his writing, guitar playing and distinctive vocal delivery. 'Encomium' is defined as 'formal or high blown praise' (Concise Oxford Dictionary). Participating artists include Al Stewart, Johnny Marr's Healers, Roy Harper, Chris Smither, Brooks Williams, Steve Ashley, Bernard Butler, Donovan, Steve Tilston, Eleanor McEvoy and Ralph McTell. The 26-song double album comes with a fully-illustrated 20pp booklet with notes by the artists and an appraisal by Colin Harper, whose biography of Jansch is published in the UK in August by Bloomsbury Press. June 1999 saw the release of a new album of songs by Jansch,"Crimson Moon", whilst Jansch's catalogue undergoes reissue this autumn. "The variety and quality of performances and the very detailed liner notes make this album a worthy tribute to a legend." "A wonderfully diverse 2CD set with handsome packaging. required listening and a must-have. Your collection of British folk won't be complete without this. " the highlights make this double CD well worth the effort. Current faves include Duffy Power's husky I Am Lonely, Roy Harper's beautifully resigned Needle Of Death and, perhaps bravest of all, a shattering rendition of Blackwater Side from Kelly Joe Phelps." an erratic but intriguing tribute." a vast range of disciples and devotees pay homage across 26 tracks. All songs seem strangely appropriate (e.g. Al Stewart with Soho) which suggests that the artists have given some thought to their choices and have mostly delivered outstanding, well-crafted interpretations." a terrific album. A treat!" "Now this is something rather special. There are many reasons for buying this album: fine music, a new perspective on Jansch's work and artists' sleeve notes which emphasise the respect and affection Bert is held. Hell, Roy Harper singing 'Needle Of Death' would be enough to makje me grad a copy. Whatever your reason: buy it."